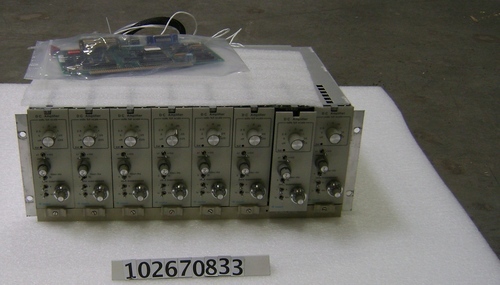 Object consists of a rack-mountable chassis containing 8 instrumentation DC amplifiers. The ampifiers are attached via cable to an interface printed circuit board. There is another interface cable attached to the unit. There is a power cord zip-tied to the unit. This unit was found in a PDP11/70 cabinet (acc# 102678032).